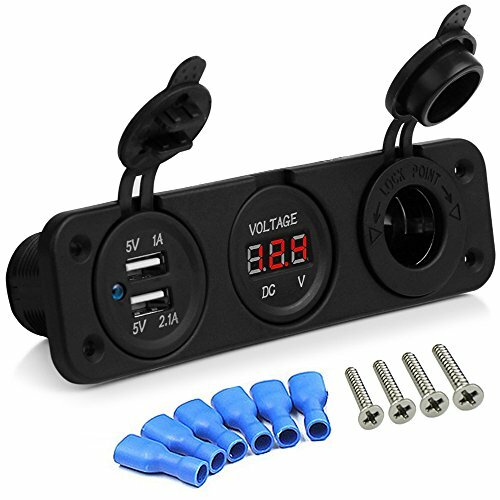 SPECIFICATIONS: This Universal 3 in 1 Cigarette Lighter Socket + Dual USB + LED Voltmeter combo is great for those who are on the go. Wiring kit for cigarette lighter to be installed in any 12V-24V motorbike, Boat, Riding mower, tractor etc. Optimized for iPad, iPhone & iPod - fast charging at full speed (2.1Amps for iPad, 1Amp for iPhone/iPod). Apply to all electronic products. Run multiple accessories at one time, very convenient and easy to use.